In 1979, when Margaret Thatcher became prime minister, out of the 4 major European countries, the United Kingdom was the poorest. It had a lower gdp per capita than Germany, France and Italy. 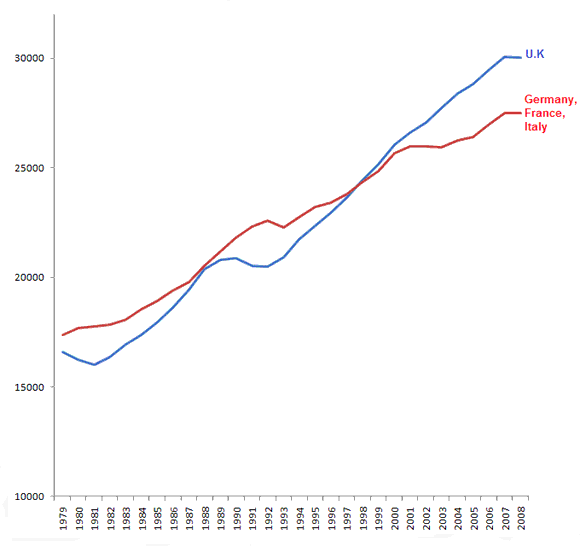 But the U.K subsequently grew faster than the other European countries. By 2008, the latest available year, the U.K was the richest out of the 4. White the U.K in per capita terms was 7% poorer than France in 1979, it was 10% richer than France in 2008. This graph shows real per capita GDP (from OECD) for the U.K, and a population weighted average of the other 3 major west European nations: Germany, France and Italy. As you see they start of richer than the U.K in 1979, but by the end of the period the U.K is richer than the average (and richer than any individual country). It will be interesting to see if this advantage is maintained after the crisis. There is a strong case to be made that Thatcher’s pro-market reforms had a lot to do with this remarkable recovery.